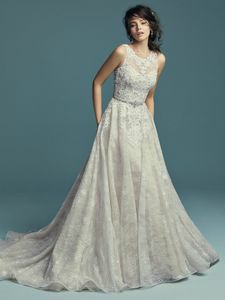 Description: This sleeveless wedding dress is comprised of allover lace and Tuscan Organza, with striking lace motifs accenting the bodice and jewel neckline. Lace motifs trail from sheer back to hem in the shimmering A-line skirt. Finished with covered buttons and zipper closure. Beaded belt accented in Swarovski crystals sold separately.